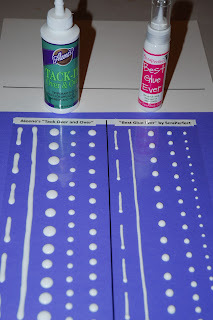 ... not to be confused with my earlier tutorial on Making Your Own POP Dots, this tutorial will show you how to make adhesive clear glue dots to use on your cards or scrapbooks. 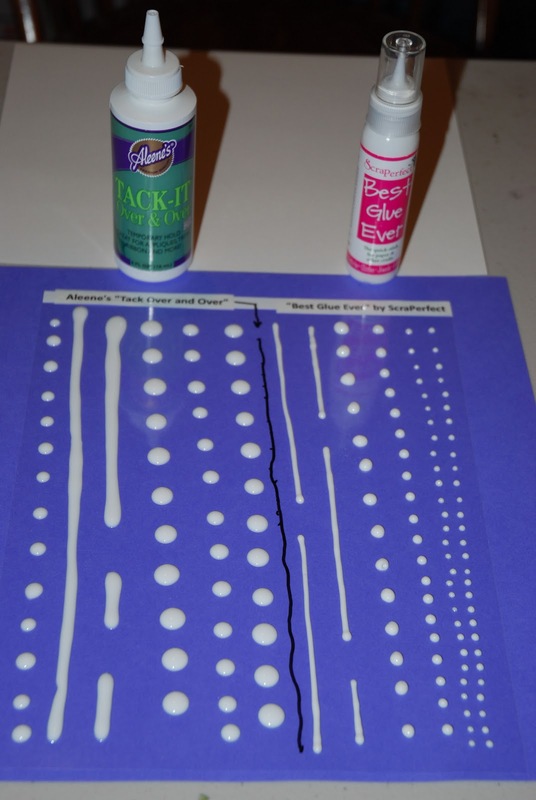 I've seen a few tutorials on this, using different glue products. Also, all of the tutorials I have seen will tell you to use coated paper that has carried an adhesive on it. For example, re-use the paper from a pop-dot roll, or paper from a Xyron. Instead, I am going to try to use a clear acetate sheet as my base. It is more readily available, I think. For my tutorial, I am usings some leftover overhead transparency sheets I used in an earlier tutorial. (See: Making Your Own Rub-On Sentiments) Use the shiny, not textured side of these overhead projector sheets! The glue I am testing are two of the most highly recommended for this purpose: Aleene's Tack-It Over and Over, and ScraPerfect's Best Glue Ever. I've never used either of these glues before, so you're learning with me. I bought both of them through Amazon.Com. I'm sure there's a cheaper resource for these, but this was the quickest for me. I've heard wax paper works too, never tried it, let us know how they work. You know that means you have an excuse to craft tomorrow! Hmmm. I heard waxed paper DOES NOT work, so off to the PaperJungle I go. I will post the pics/results a bit later. Please check back! OMG.... I think this is fantastic.... I can't wait to see how this works I'm going to have to try this out.... Thanks for the thrifty tip!!!! as my thanku I have a gift for you on my blog ;click here to claim. What a great idea. I can't wait to see how it turns out. Smarts! I have an award waiting for you at ScrappyScavenger.blogspot.com come on by and pick it up! Nice work. I came across your blog while blog surfing using the “next blog” button on the Nav Bar of blogger.com. I am continually fascinated by the types of blogs that exist on the Internet, and the various, creative ways in which people all over the globe express themselves. Thanks for sharing. I heard about this two years ago at the Madison Mingle but didn't hear the part about wax paper. So I tried with wax paper. Doesn't work, just sticks really good to the paper. It makes so much more sense to use a paper that is made for sticky things. Thanks for the tip. I will once again try it. Has anyone tried parchment paper?? I wonder if freezer paper would work. I'm excited to try this. Thank you for this idea. I made some with the Aleene's tack it over and over glue and it worked great. I'm never doing store bought again! You can see my post here. Thanks I use so many glue dots myself, my children's church and my GA's. This will help so much with expenses. I'm curious to know which one worked best. But, I'm a little confused, too. With Aleene's Tack It Over & Over, tells me it wouldn't be a permanent hold glue dot, just a temporary so you can move whatever you are gluing "over and over". I dont' have much use for those types of adhesives. I need permanent hold adhesives, so I guess my other question is whether or not they are working as a permanent hold glue dot? I'm using the Aleene's to make the dots In a project for 900 gift bags. Thought I would come unglued, no pun intended, when I couldn't buy this at Michaels, Joann's, Hobby or Walmart. Then I was able to order online with delivery to the closest Walmart. Got 3 bottles just in case the company was phasing it out. They had better not. It is saving me a few hundred dollars! I've heard of this before but have never tried it. Would have been nice if you actually came back after letting them dry and then using some on projects to let your readers know if they work well and which glue works best for actual adhesion on the projects. This was a waste of time since there's no conclusion! Check April 3rd for update on diy glue dots...and geez be nice please!! Thanks CardMonkey for your Awesomeness! ! I have used Aleen's tack it Over and Over for glue dots and find them really hard to remove from the "removable" sheets that I use--previously used for purchased glue dots. Is there something I am doing wrong? I tried something similar only they suggest a clear CD case...Had a sticky mess. will try yours next!!!!!!!!!!!!! !